Standing, from left to right, are: Julie C. Jones, Lindsay Hardy, Katherine Magouirk, Jacqueline A Jensen. Kneeling, from left to right, are: Angela Brown, Barbara Sexton, Christy Sue Crouch. Five SHSU undergraduate students attended Math Fest, the national meeting of the Mathematical Association of America, in Boulder, Colo., this summer. All five students gave talks on research that they had conducted over the past school year and over the summer. The title of their talks were: "An Overview of Molecular and Crystallographic Symmetries" by Angela Brown, "Which Came First: e or Natural Log?" by Christy Sue Crouch, "Three Hundred Fifty Years of Proving Fermat's Last Theorem" by Lindsay Beth Hardy, "A Statistical View of the Death Penalty in Texas" by Katherine Magouirk, and "Means of Complex Numbers" by Barbara Sexton. Sexton won the award for the best talk in her session. “We are incredibly proud of all five of the students. We are so impressed with the time and effort that they put into their presentations, especially considering the fact that it is completely voluntary, and they receive no class credit for it,” said Julie C. Jones, assistant professor of mathematics and one of two advisers for the SHSU student chapter of MAA. Jacqueline A. Jensen, also an assistant professor in the department, is the other faculty adviser of MAA. 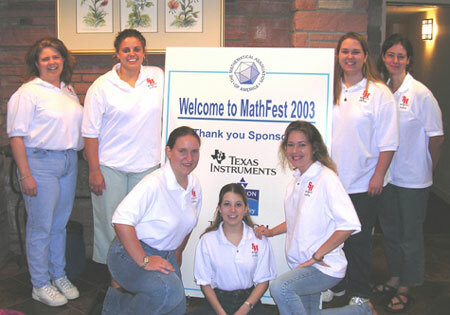 Math Fest is the annual national meeting of the Mathematical Association of America, which is held during the summer. Students from all over the country participate. While many of the members of MAA are research mathematicians, MAA is a national mathematics organization devoted primarily to mathematics education and undergraduate research. The Lowman Student Center Office rang in the ‘new year’ with a successful second LSC Scavenger Hunt on Tuesday, according to director Keri Rogers. This semester’s student winners are as follows: alumni brick – Jovanne Norris; CD/DVD Player – Elliott Jordan; 20-inch television – Jennifer Carter; free use of textbooks for spring 2004 – Mitchelle Joseph; catered dinner for eight in LSC – Sandra Beasley; and college survival kits – David Louie, Lauren Luman and Lisa Thornton. Faculty and staff winners include: University Club lunch for 10 – Amy Swingle; Kat Klub party and sundaes for up to 25 – Debbie Nichols; and a sony walkman – Wilbert Hightower. Winners can claim their prizes, which should be picked up as soon as possible, in LSC Room 303. Prizes that are not picked up by Sept. 15 will be held for the next scavenger hunt, which will be held in the spring, according to Rogers. The Office of International Programs will welcome new students to Sam Houston State and to America with their second International Student Welcome Picnic on Sept. 6. The event, which will be held from 10 a.m. to 2 p.m. at Gibbs Ranch, is open to all faculty, staff, international students and anyone interested in the international students program, according to Brenda Boeske, coordinator of operations and international student adviser. “The picnic is to welcome the international students,” she said. The first picnic, which was held last year, had a very good turnout, according to Boeske. For more information, call the Office of International Programs at 936.294.3892. The department of academic instructional technology and distance learning will sponsor a technology mini-conference on Sept. 24 from 1-4 p.m. and again on Sept. 25 from 8 a.m. to noon in the Lowman Student Center Ballroom. “The conference is geared towards faculty, but students are, absolutely, welcome to attend,” said James Van Roekel, director of the department of academic instructional technology. Several groups, including University Computer Services, Newton Gresham Library, Criminal Justice and Radio and Television will demonstrate different technological applications available on campus and how these tools are being used to create content. The informal poster session style multi-media circus will run from 9 a.m. to 4 p.m. Faculty members who would like to demonstrate their use of technology are invited to participate. Contact Van Roekel for more information at vanroekel@shsu.edu. Sam Works, a networking opportunity for BearKat alumni, will be held on Sept. 2, from 5-7 p.m., at Casa Tomas. Free hors d'oeuvre will be served at the informal meet-and-greet, hosted by Casa Tomas and the Alumni Association. In addition, members of the Alumni Association will receive his/her first beverage for free. For more information, call the Alumni Association at 936.294.1841. Photographs by Linda Wiley, an accomplished flutist and published author, will be on exhibit at the Walker Education Center Gallery from Sept. 1-21. The exhibit, titled “Passages”, includes views from Italy, New Mexico and other locales. The School of Music is tuning up for a semester of performances with recitals on Tuesday and Saturday. On Sept. 2, the School will be hosting a Faculty Vocal Recital, featuring Kristen Hightower, SHSU instructor of voice at 7:30 p.m. at the Recital Hall. On Sept. 6, the School will be hosting a String Invitational, with SHSU strings area coordinator and assistant professor of music Andrew Wilson, serving as conductor. The event will be held from 8 a.m. to 5 p.m. in the Killinger Auditorium, Fine Arts Building and the Recital Hall. For more information on the events, call the School of Music at 936.294.1360.